I am based in New Generation’s spiritual home of Courchevel and I love the place. Courchevel provides me with the vehicle for 100% job satisfaction. There are many reasons why I think Courchevel is such a great venue for an instructor-training program, so I will attempt to layout some things to look for when choosing a resort and why Courchevel ranks so highly. The first thing to consider (and is really the only thing to consider) is the snow and piste quality. Courchevel really delivers, and here are some key facts to back me up. Courchevel has a high percentage of north facing slopes, meaning the snow quality is going to be always high. When the snow fails to fall, Courchevel has world-class snow-making infrastructure, meaning as long as its cold enough you can always ski. When connected to the 3 Vallées it provides you with 600Km of linked pistes and over 170 lifts, making it one third of the biggest ski resort in the world (Portes du Soleil claims to have 650km, but you have to get buses so it doesn’t count). Courchevel provides a wide range of terrain for all abilities, making it a ski instructors dream. I could go on, but I think you get the picture: pistes and snow quality get a big tick in the box. Outside of what the resort itself has to offer, you should also consider the qualities of the training program being run in each resort. The qualities that make our Courchevel programs succeed have always been, and always will be, the team of people involved in it. For me it is all about the challenge and enjoyment of working hard for each other as a team, trying to be the best you can be. Whether that be the trainees motivating each other to be on the first and last lifts for extra practice, the trainers staying up late planning their training sessions, or the support staff going that extra mile to make sure the training team are supported with any off snow issues. Overall it is the qualities of the whole team that counts. I could not do my job as a trainer without the hard work of the support staff and trainees and vice versa. Our team is made up of some extremely talented people, we have some amazing linguists, excellent organisers / carers, brilliant motivators and first class skiers and coaches. We all share the same passion, which is to make the program the best it can be for everyone……so again another tick in the box. Unfortunately, you can’t ski all day and as après ski sessions don’t always mix well with long ski sessions the following day. So it’s important to occasionally find things to do outside of visiting the après bars in the evenings! Courchevel has plenty of things to do: it has an ice skating rink, which regularly hosts exciting ice hockey matches and other fun events. There is also a bowling alley (my claim to fame was having the second highest score for 2015-16 season, not as cool as having the top score mind you). Just outside from the ice rink and the bowling alley is the awesome lüge track – its amazing fun but be prepared to unwrap yourself from around a tree and wear some body armour! There is also a cinema, which regularly shows the big new film released in English, so no need to worry about missing Star Wars Rouge One this December, phew. There are heaps of things to do outside of skiing but the latest addition is the Aquamotion Centre in 1650. Aquamotion has a climbing wall, a 25m laned pool, 2 big diving platforms, 2 big water slides, an outside / inside leisure pool, a big spa for relaxing and awesome wave riding machines. It is so much fun and defiantly worth a few trips. The best thing about all these things is that you can get to them for free using the resort bus service. It goes around all of the areas of Courchevel from early morning until pretty late at night. As with most ski resorts, there is a lively après scene all over Courchevel, and with free buses it is very easy to get to the different events. Admittedly I am not an authority on all things après (I’m usually in bed at 9pm reading my Science Fiction comics). The area of Courchevel where we base our residential course accommodation is called Le Praz (1300m, directly below the main resort). The main places to go are the Drop Inn and L’Escorchevel (aka “The Pizzeria”). Both of these places have events on at different times through the week. The most popular being Tapas Tuesdays at the Drop Inn and band nights on Tuesdays and Fridays at L’Escorch. Both of these places play the big sporting events be that rugby or football and can get pretty lively if there is a big match on. Of course with the aforementioned bus service, you can always head up to 1650 to the lively Funky Fox , Bubble or Boulotte, or venture up to 1850 for a classy night out too. Courchevel has heaps of special events on during the year, and my favourite is definitely the Ladies World Cup race that is held before Christmas each year. It is a great chance to watch the best skiers in the world up close. Another really popular event is the Firework World Championships (yes, you read correctly!). I remember the first time I went to one of the displays I was a bit dubious (believing that once you have seen one display you have seen them all). However the displays during the championships are incredible and definitely worth standing out in the cold for – there’s even some vin chaud to keep you cosy. Other events worth checking out during the season are the Valley Rally and Charity Day music festival, the latter of which is getting bigger and bigger each year. Last year Jo Wiley of Radio 1 hosted the event! Finally if you are up for a challenge there is a regular weekly event held in Courchevel called the Millet Ski Touring Race. It is a ski touring race from Le Praz to Courchevel 1850, with a 3.2km long course and 500m of vertical climbing it is not for the faint of heart. People travel from quite a distance each week to take part and try to beat their time from the previous week. So there you have it, Courchevel, lots to do, lots to see, lots to ski. 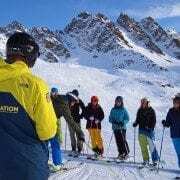 We’re now taking bookings for next years Courchevel BASI 1/2 and ISIA courses, so book early to benefit from the early bird price-freeze!